Discussion in 'Plugin Development' started by Orcane, Feb 11, 2017. I've being struggling with trying to find out how to get an item's NBT tag for a while now, I'm pretty terrible at Java at the moment. So if anyone could write out a the code to say, get the NBT tag of the item in your hand with an explanation of what is happening, it would be very greatly appreciated. It appears getting LivingEntity NBTs is not done the same way, so how would you go about getting them? What NBT tag do you need? For which entity? 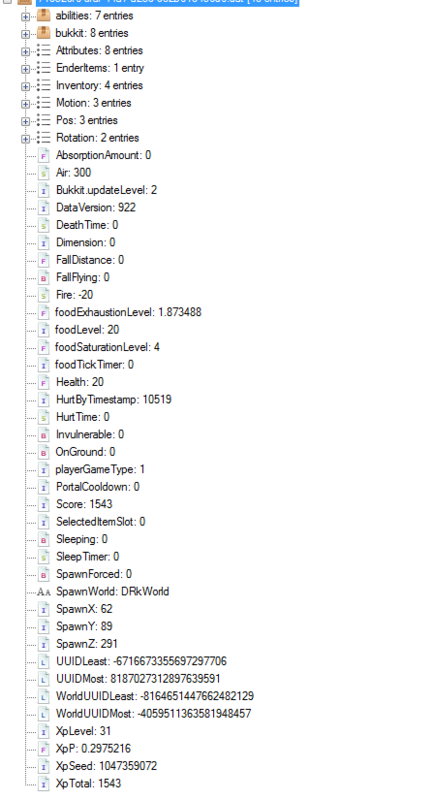 http://minecraft.gamepedia.com/Tutorials/Command_NBT_tags That might help, but you could also download NBTExplorer and see what tags your player object has in the world/playerdata folder. I have a pretty good idea of what NBTs are, what what I want to edit. I just don't know how to do it with Java. @Orcane you mean the Bukkit API, but alright. a.setTag(tag); //Update the NBT Tag. itemHere = CraftItemStack.asBukkitCopy(a); //OR set the item in the inventory manually, depends on what you want. You could also return itemHere and that'd be the modified stack. I believe this code would erase all enchants on the item, and perhaps make it just the glow (the NBT system has become smarter with Minecraft nowadays, though. NBTTagCompound and NBTTagList both extend NBTBase. You should just try getting the variable and typing a period after it and seeing what comes up. Once you get an error is when you should be asking for a bit more help.